Larry Lessig is considering running for Congress. The scale of change that Lessig in office could cause, I believe, is profound. His work to rid Congress of special interest influence within 8 years would leverage a “Crowdsourced Congressional Staff” of 10,000s. Unlike the Congressional staff I worked on during my year off after high school in 1989– a GOOD staff for a GOOD Congressperson– his Congressional staff of 10,000s wouldn’t be engaged in taking constituents out to lunch or getting a speedy passport issued upon request, or even dealing much with the minutia of a piece of legislation. Rather, his crowdsourced staff would bring the wisdom of crowds to Capitol Hill in a manner we’ve never seen before, and would be at once the force of displacement as well as the fill for the power vacuum created as the special interests depart. Also, he gives great presentation. Enjoy. 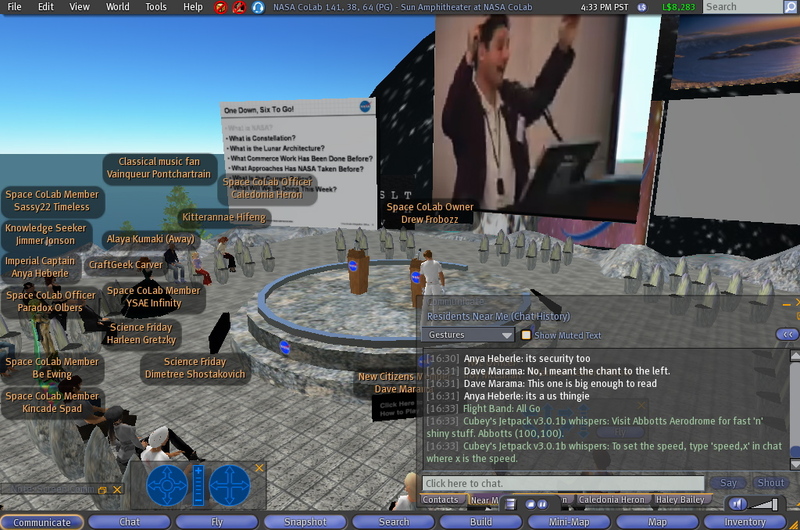 We had the “Next Generation Exploration Conference II” streaming into NASA CoLab in Second Life all day today, creating a mixed reality conference. 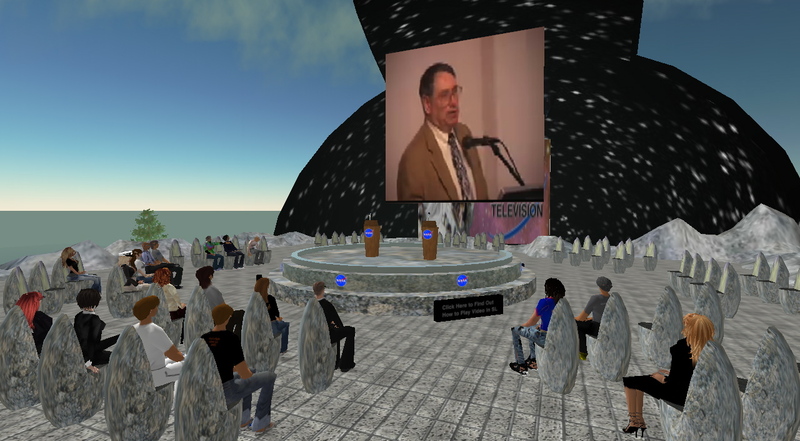 Below, NASA Ames Center Director Pete Worden (above) and NASA Headquarters’ Ken Davidian (below) address NGEC up to 50 avatars on NASA CoLab island in Second Life as well as 100 young space entrepreneurs and NASA employees at NASA Ames in Silicon Valley. The conference continues on Wednesday with a blended Second Life and Real-Life working group on Lunar in-situ resource utilization. I’ve been thinking a lot about how a new wave of “reinventing government” can occur, and what it would substantively entail, under a new Presidential Administration in 2009. Most of my thinking draws on my hands-on experience in one little corner of the Federal Government with our NASA CoLab program, but I want to draw far beyond that. The ADI Leadership Forum I participated in on Saturday had a breakout session on this topic lead by Mitch Kapor and David Weekly. We didn’t get very far in that 1 hour session (the take-home, after a rather excruciating debate, was “more openness would be good”), but it WAS great to see that the topic was on the radar screen of this community enough to be put on the program. I’ll be talking about our experience with co-working at NASA at PSFK‘s great New York conference in March… Would love input about what to cover as I prepare my talk.